The roof of the original 1960s Grade II* listed building has remained whereas the rest of the building has been remodelled. The new building aims be the world’s leading museum of contemporary design and architecture: ‘an international showcase for the many design skills at which Britain excels and a creative centre, promoting innovation and nurturing the next generation of design talent’. It aims to welcome over 650,000 visitors to the building each year including 60,000 learners to use the Swarovski Foundation Centre for Learning. 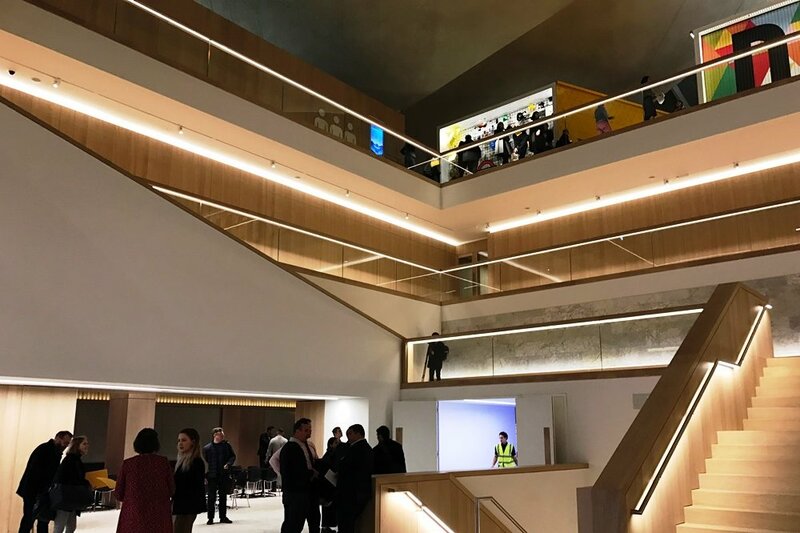 The main exhibition and event spaces on the upper basement, mezzanine and first floor use over 800 Concord Beacon Muse 3000k White track mounted spotlight to provide flexibility in beam angle control and light levels. Over 200m of Lumiance Lumistrip has also been installed in the exhibition space to provide indirect light above the exhibition panels whilst the entrances have Mini Continuum with integrated spotlights. Concord worked with Lutron to provide a DALI control system for the project. The system allows for individual dimming and control of all the luminaires throughout the scheme to ensure the required effect is achieved in each space and it will cater for flexible use during both daylight and night time hours. In total, there are 1,200 Beacon Muse spotlights installed in the building project mounted onto around 1,000 metres of Lytespan 3 track. In the two temporary galleries as well as the educational areas and studios Concord Beacon Muse luminaires have been installed in combination with Concord Mini Continuum LED to provide a combination of ambient lighting with focussed task illumination from the spotlights. Mini Continuum is used in a combination of track mounted versions for the studio areas, pendants for larger areas as well as Mini Continuum Direct / Indirect through the office spaces lighting the desks whilst enhancing the working space with indirect light on the ceilings. 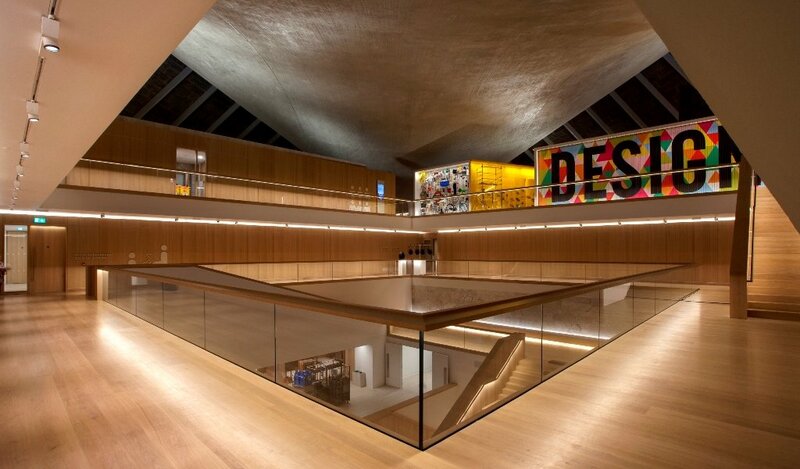 “The team at the museum was very hands on during the process and knew exactly what they wanted. For instance, the spotlights within the galleries have on board dimmers so the staff can focus and set light levels themselves, a key requirement for the project,” says Large. The 200 seat Bakala auditorium has a fully controlled lighting system that features both Mini Continuum and black Beacon Muse luminaires to blend into interior decor. Across the whole building, the luminaires have been designed to blend into the décor with black trim Concord Ascent 150 downlights, mini continuum and beacon discreetly lighting the Retail spaces by matching the ceiling design, whilst Beacon Muse on drop rod extensions, have been employed to subtly illuminate the space through a woodened beam ceiling design structure. The lighting scheme is finished off with specialist luminaires for areas such as the Member’s lounge and Parabola Café & Restaurant, where the 90 Concord Myriad V downlights have been fitted. These luminaires have a colour tuning engine to take the room from 2,700k as an intimate dining space to 4,500k for functional and service use at other times. For the central parabola ceiling, Concord supplied high output surface mounted and floor recessed LED projectors (by Anolis), to provide accent light to this feature. The lighting scheme extends to the back of house with Concord providing IP65 recessed fittings for kitchens, Ascent downlights for the bathrooms, LED surface mounted panels in the basement and IP65 Sylvania Sylproof LED linear fittings for the plant rooms and loading bays.